The diamond and pearl tiara commissioned by the Grand Duchess Vladimir; it was bought by Queen Mary and left to her granddaughter, Queen Elizabeth II. It is currently on show at the Queen’s Gallery in Buckingham Palace as part of the Russia, Royalty and the Romanovs exhibition. I have noticed from the reader activity on my blog that there seems to be a special interest in jewels formerly owned by the Romanovs- my blog entry on the famous pearl and diamond tiara commissioned by the Grand Duchess Vladimir (aunt by marriage of Tsar Nicholas II) seems to have elicited particular interest. There is an opportunity, for those who are interested, to go and see this jewel up and close for a limited time only. I am not going to go into the history of the piece again- click here if you would like to read the background of this fascinating jewel. The tiara is part of a much wider exhibition being held at the Queen’s Gallery beside Buckingham Palace in London. The title of the exhibition is Russia, Royalty and the Romanovs and is an insight into the close links the royal houses of Great Britain and Russia maintained for 300 years. These started when the Emperor Peter, also known as Peter the Great, spent some months living in London at the end of the 17th century in an effort to learn European engineering and culture. 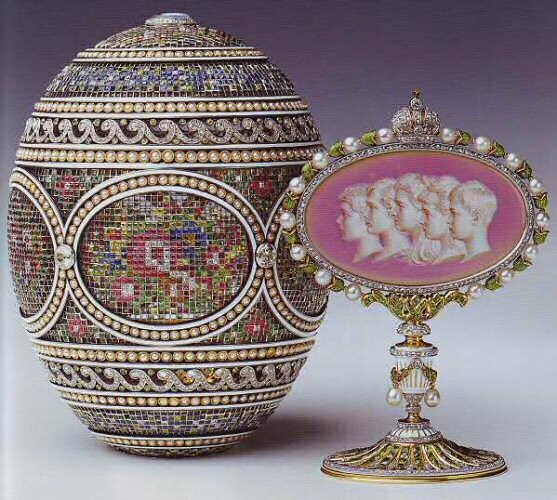 The Mosaic Egg of 1914 by Fabergé, currently on display at the Queen’ Gallery in Buckingham Palace. 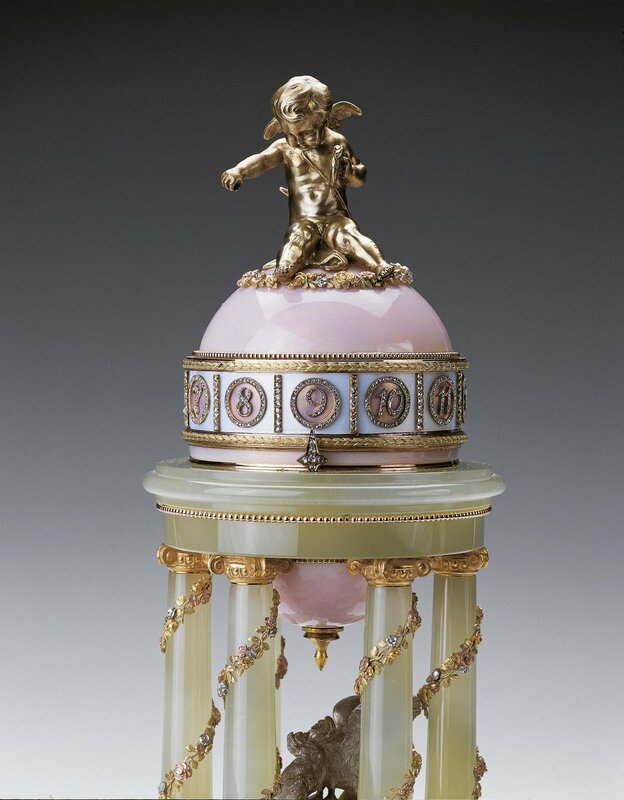 A detail photograph of the Colonnade Egg of 1910 by Fabergé. The exhibition offers some fascinating exhibits; as a jeweller, I have to be completely biased and say that it is worth going to see for two reasons: the Fabergé on show, which is almost incomparable- it is of the highest quality possible and includes three of the famed Imperial Easter eggs, as well as an important selection Fabergé hardstone flowers. It is rare to see such a exemplary pieces from a private collection all on show together. 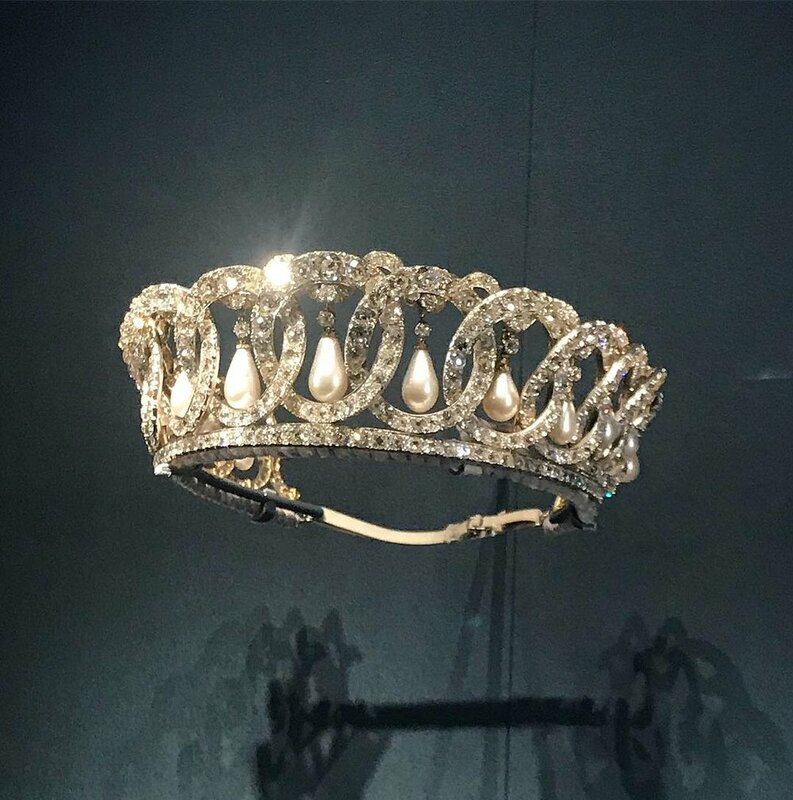 And secondly, of course, the famous tiara- displayed alone, in a darkened side recess of the gallery, emanating legend not just legend and Imperial mythology, but also a glittering example of the jewellers’ craft and design abilities at its height. A fine three quarter view of the Grand Duchess Vladimir tiara .